There were wins all round for our Saturday teams with the 1sts beating table-topping Caythorpe, the 2nds sending Hucknall to the bottom, the 3rds maintaining their unbeaten league form with a win over Cotgrave and the 4ths completing the set with a win over Notts and Arnold. set a tough target but three quick wickets for Akif Farooq ripped out the middle order and set Caythorpe back and at 186 for 9 looked almost out for the count before a last wicket partnership took them to 224 all out. 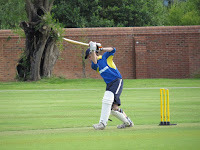 Stanny Simon with 5 for 43 and Akif 4 for 70 were the leading wicket takers. We got off to a decent reply with Sam Clulow shining with 45 at better than a run a ball. When he was out we were up against the ropes as we slipped to 94 for 4 but a good partnership between skipper Craig Heiden, who finished unbeaten on 67, and Thom Murray 23 took us closer to a tremendous victory which came with 1 over and 4 wickets to spare. The win moves us one place up the NPL into 8th. For the 2s there was a trip to struggling Hucknall where defeat would have been a real body blow to promotion prospects. A rare toss win for Rich Henson allowed us to take first use of the wicket and a steady start was interrupted by a retirement for Allan Moss after being hit on the hand by a fielder trying to effect a run out. Allan returned later in the innings to top score with 57, Will Shields made a fluent 41 and Chris Allcoat weighed in with 31 in a total of 197 for 9. 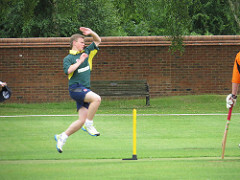 Hucknall claiming full bowling points whilst failing to bowl the 2nds out. A couple of early wickets for Jai Jandu, who finished with 3 for 33, was followed by a good stand that took the hosts to close to a hundred and just ahead on points in comparison to our score at the same stage. The game then turned within the space of 7 balls as Hucknall's leading run makers were both dismissed by Will Shields and Chris Allcoat removed the skipper after some astute field placing by the skipper - or so he tells me! 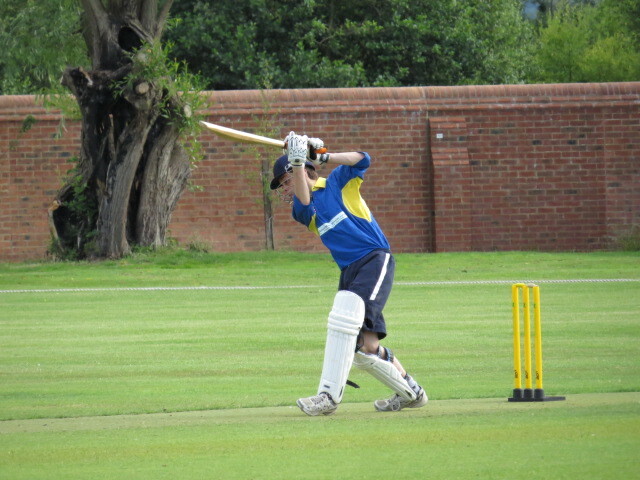 After that the innings fell away quite quickly with the knock out blow coming in the 39th over. Will Shields finished with 4 for 33 and Chris Allcoat 2 for 15.
recorded their tenth league win of the season. Batting first on a difficult wicket the innings revolved around Colin McConnell 74* and a dashing 58* from Matt Shaw to see us to 196 for 3 from 45 overs. 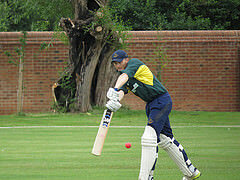 Cotgrave were never in the hunt as they were bowled out for just 89 with Nick Anderson-Pearce claimed 3 for 12. A full 20 points to increase the lead at the top of Division J.
runs. Carl Knight recorded his second century of the season making 118 and sharing in great stand of 111 with 14 year old Finlay Meakin who fell just short of a maiden half century in scoring 48, an innings that showed great maturity as he improves week by week. The innings closed at 216 for 7, a total the visitors were never likely to match particularly after two more youngsters, Matt Hubbard 3 for 6 and Reece Caine 3 for 24, had struck. The 4s moved up one place in the table to 2nd, hot on the heels of leaders Farndon, in recording their 8th win of the season.